In Newmarket, Platinum Party Bus Limos can provide you with a positive limousine experience from the reservation, to the party bus fleet of choice all the way down to the limousine driver. All of these services are what you can expect when you reserve a party bus limousine from Platinum Party Bus Limos in Newmarket. The type of limousine services that you can rent a party bus for includes wedding limousine services in Newmarket, prom limo rentals, night out limousine services, corporate limo fleet and more. 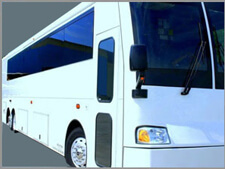 All of these services are complimented well with a party bus because the vehicles that you rent from are very luxurious. The selection of fleet that you can choose from includes 18 passengers up to 26 passengers for our party bus limos, and for our larger limousine buses, you will be able to seat 30 comfortably, up to 50 passengers. Great for a casino limo ride from Newmarket to Niagara Falls and Casino Rama. When you have decided to choose Platinum Party Bus Limos for all your party bus limo needs in Newmarket, give us a call today to speak with one of our booking agents who will be able to assist you.